CES 2014 threw up all sorts this year. There was the return of virtual reality with Oculus Rift, the introduction of wearable technology, but more excitingly, the revelation that our homes can become even more futuristic with the releases set for this year. Over the past few years our living spaces have become more and more centred around technology whether that be a television set, games console, or even computer systems. Sony’s Life Space UX looks set to emphasise that more than ever before. We’ve all heard the term ‘size matters’ and when that size is 147-inches it’s never been more appropriate. 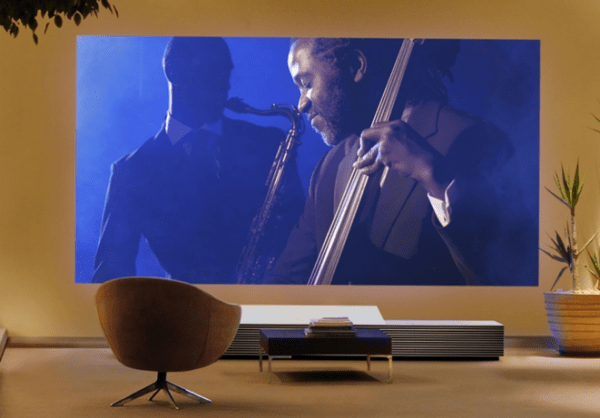 The Life Space projector has the ability to completely take over a room, a HD focal point, where you can watch the latest blockbuster as though you’re in the cinema or immerse yourself in games almost as though you actually storming the beaches of Normandy in Call of Duty. It isn’t just the Sony that’s transformed our rooms into one big interactive space however. Gaming in particular is not only developing into a high-tech, high-definition industry where games like Grand Theft Auto V generate nearly $1 billion in revenue, but have also become all-in-one entertainment systems, with the latest PlayStation including Netflix, catch-up television, and even the chance to share your experiences on social media. Of course these come at a cost. The Sony projector is likely to set you back between 30 and 40 thousand dollars when it’s released in the summer, while the PS4 is retailing around $400. You’d have to be a footballer, or an actor, or perhaps even a burglar to get your hands on the Life Space but you don’t necessarily need a big screen to immerse yourself in gaming. PC gaming is once again becoming extremely popular, and with HDMI cables able to pick up as easily as a loaf bread, online games such as World of Warcraft and even the tables featured on Freebets Casino, can be enjoyed in all the splendour of a console. It’s eventual that our living rooms will turn into a totally immersive space with our televisions being at the very centre of our lives, which is no surprise. Television is its golden era with the likes of Breaking Bad and Game of Thrones having every superlative in the dictionary thrown at them, whilst games for next generation consoles are becoming more cinematic by the day. And technology has to keep up with that. We’re already seeing the first signs of a revolution. 3D TV has been around a little while now and is slowly creeping into the mainstream, whilst ScentScape from ScentSciences could transform our living spaces further adding the sense of smell to our entertainment somehow managing to create an entirely real virtual reality.